Great Britain suffered double defeat by Australia in the FIH Pro League as the men and women both lost in Perth. GB's women, playing their second game under new coach Mark Hager, improved on their 5-1 thrashing by New Zealand earlier in the month. But goals from Kalindi Commerford, Mariah Williams and Savannah Fitzpatrick earned a 3-0 win and kept GB bottom of the table. GB's men lost 2-0 thanks to goals from Trent Mitton and Jacob Anderson. 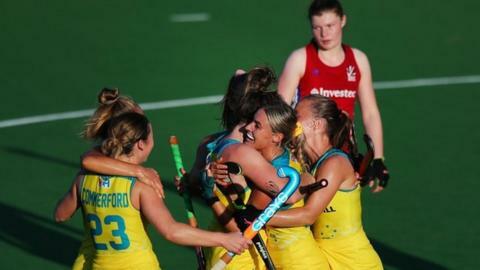 The result ended a run of successive wins against Spain and New Zealand. The women's team have had a unsettling few weeks after former New Zealand coach Hager's appointment was followed by the news that he is under investigation for allegations of bullying. After the defeat by Australia, GB women's captain Holly Pearne-Webb said: "New Zealand was our first game together as a new team, but there was a lot of progress. We are feeling much more positive. "We only found out a few weeks ago about Mark. I think we are going to do really well with him." Earlier on Saturday, the GB's men's team failed to break through a stubborn Australia defence despite enjoying the majority of possession. The visitors had two penalty corners in the first half but failed to take advantage and now sit third in the standings behind Belgium and the Netherlands before their next match against Argentina.